Copyright © 1982-2014 Remote Systems™, Inc. All rights reserved. 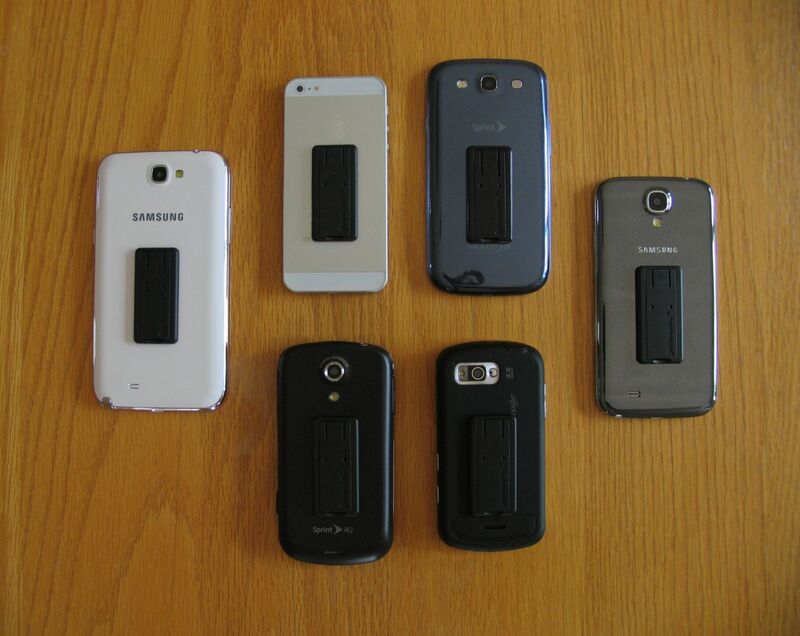 See a photo collage of kickstand4u™ mobile kickstand on actual product. My latest project design is a mobile smartphone kickstand. 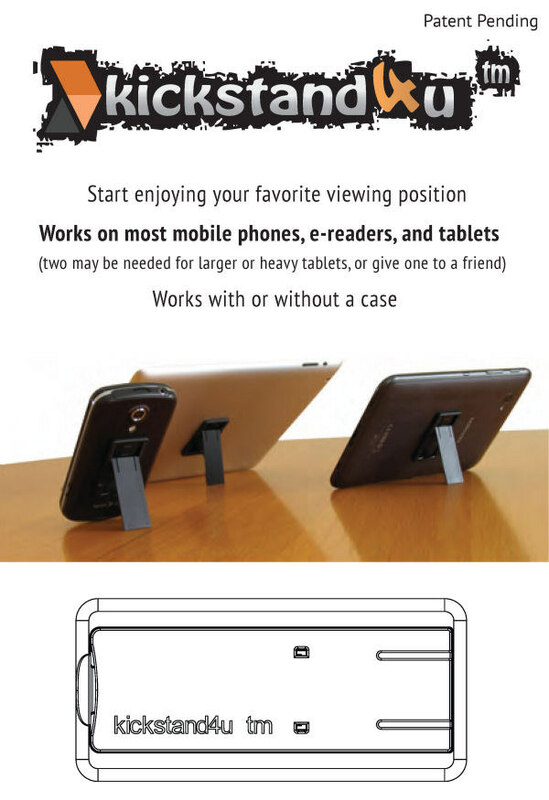 A Patent Pending device I call kickstand4u™ This will work on all mobile phones, small and large tablets, e-readers etc. Basically, the kickstand4u™ mobile smartphone kickstand will work on all mobile devices of any size whether you use case or not. Almost all of these devices do not come with any sort of stand. Your only choice is to find something where you could prop them up against in either the vertical portrait or horizontal landscape position so you could enjoy hands free viewing. Even then they never seem to stay put or in place. Carrying another cumbersome and sometimes bulky accessory is an after thought and not very portable at best. As light as some of these devices are, holding them still became rather heavy after prolong use. That was the beginning of my Patent Pending(s) kickstand4u™ mobile smartphone kickstand with Sure Grip™, Tablet Extender™, and Tripod Mount was born. After many prototypes, I have come up with a simplistic yet highly functional design. There are other various mobile smartphone kickstands and holders in the marketplace. But this is truly the best of breed, and where one size fits all, and because you attach it your device, it is always there with you. Ergonomically designed and engineered to give maximum functionality, it is designed to be super thin, only 1/8th inch thick, lightweight, and snag free. The easy open and close design of the with kickstand4u™ mobile phone kickstand with Sure Grip™ allows for a quick and comfortable way to securely grip your device to provide a drop free experience, and a kickstand to give you the ultimate viewing comfort in any angle no matter what mobile device you have. For larger devices, simply slip on our soon to be release Patent Pending Tablet Extender™, and Tripod Mount for even more flexibility. The kickstand4u™ mobile cellphone kickstand can also functions as a handy way to give you a drop free experience secure way to hold onto your device with a feature I call Sure Grip™, all you have to do is simply squeeze the end of the kickstand blade together to release itself away from the base. This allows you to slide your fingers thru to securely hold your mobile device. It is also a comfortable way to hold any mobile device including small and large tablets during extended viewing.